I'm Giving Away a $520 Earth Dinner Package! Greek oregano going gangbusters in the greenhouse (the left side is shorter from harvesting). I think this just might be the Year of the Herbs in my garden. Fresh herbs from the garden are a low cost, low maintenance luxury. This time of year you can often find sturdy little herb seedlings for sale at nurseries and farmers' markets for about the price of those tiny packets of 'fresh' herbs at the supermarket. No garden space? No problem. 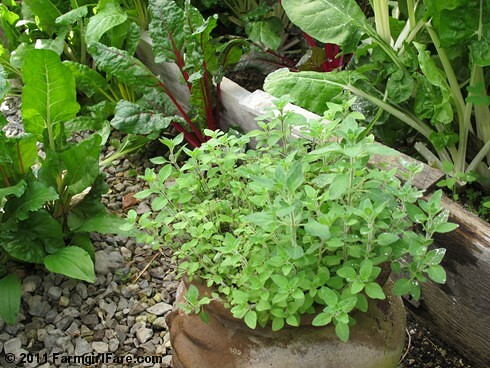 Many herbs will thrive when grown in pots. More below, including details on my biggest giveaway ever. . .
Thankfully it's an extremely cute reason. 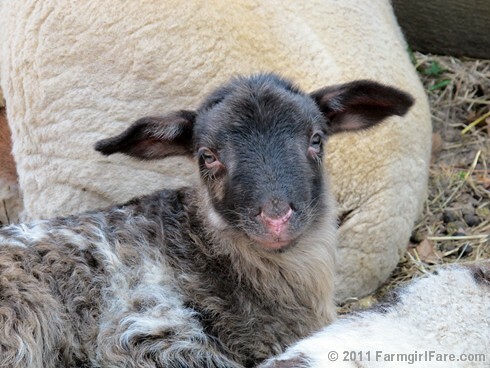 I keep composing garden blog posts in my head—but little lambs keep popping out instead. We have 17 19 to date (including three sets of triplets! ), with many more on the way. If you need a break from playing in the dirt, you can catch up with all the barnyard cuteness here. So what do sheep have to do with gardening, besides keeping me from doing much? Sheep manure! You can read all about this wonderful stuff in the post I wrote last season around this time, Using Sheep Manure as an Organic Fertilizer in the Garden (and What's Keeping Me from Working in Mine).